TWO professional workers, one male and one female, and two hourly employees, one male and one female, walk into an office. All four want to ask their boss for a flexible schedule, either to advance their job- or career-related skills or to attend to family matters. Both women expect the boss to approve their request, while the men think they're unlikely to get approval. All four ask, and their managers award flexible schedules to both men but neither woman. This scenario is true to life, according to a new study published in the Journal Of Social Issues. 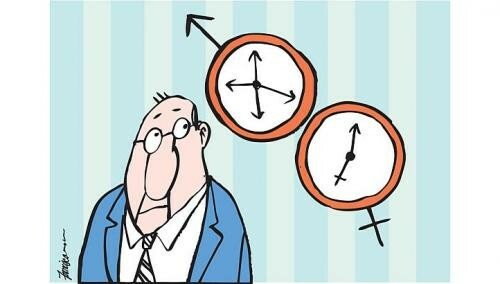 Bosses favour men over women when employees request flexi-time. A team of researchers from Yale, Texas and Harvard asked managers how they would respond to requests for a flexible schedule (in the form of a shift in work hours) from male versus female employees, from professional versus hourly workers, and for the purpose of career development versus childcare. Managers were most likely to grant a shift in work hours to the professional men pursuing career advancement opportunities. Male hourly workers also were likely to receive approval if they needed flexibility for family care. But the women - both professional and hourly - were unlikely to be granted a flexible schedule regardless of the reason for the request. Women were unable to use their professional status within the organisation or their reason for requesting flexibility to boost the probability that the manager would say yes. And the women most in need of flexible scheduling - mothers working in lower-status hourly jobs - were among the least likely to see a request approved by managers. The researchers explain the results by saying that "managers respect high-status men more than high-status women" and that "people have a fundamental psychological motive to defend and perpetuate the status quo", which, in this case, means reinforcing a gender hierarchy where men have more status and power than women. These biases are evident particularly in the finding that managers gave the flexible schedule to the professional men seeking training to advance their careers, but not their female counterparts asking for the same reason. The authors also imply an absence of trust between managers and women requesting flexibility. Because the female is associated so strongly with family care, even ambitious women seeking flexi-time to advance their careers are suspected of hiding the true reason for the request or deemed less deserving of development opportunities because they might later choose to work fewer hours or opt out. "The association between women and motherhood is so strong," the researchers conclude, "that even women who have proven themselves by achieving a high-status occupation and asking for further career training cannot overcome this actuarial mistrust of women workers." A second study in this research examined worker and manager expectations and found that women overestimated the likelihood that a flexi-time request would be granted to them (men underestimated it). It produces a situation where the people most likely to ask are also most likely to be denied. If ambitious mothers need flexibility to sustain career climbs, not receiving it is demoralising and witnessing others' requests denied is more demoralising. It's easy to understand how women might conclude that "leaning back" or opting out are not only rational but also psychologically healthier choices. But if they switch to part-time less pressured jobs or slower career tracks, they feed the motherhood stereotype that activated the negative cycle of bias in the first place. Moreover, they set the stage for further limits on their career advancement. Organisations, for their part, might as well just take a hammer to their pipeline of talented mothers and watch it leak precious human resource investments.